It was the first cold day of the year. My fingers froze, holding the camera. 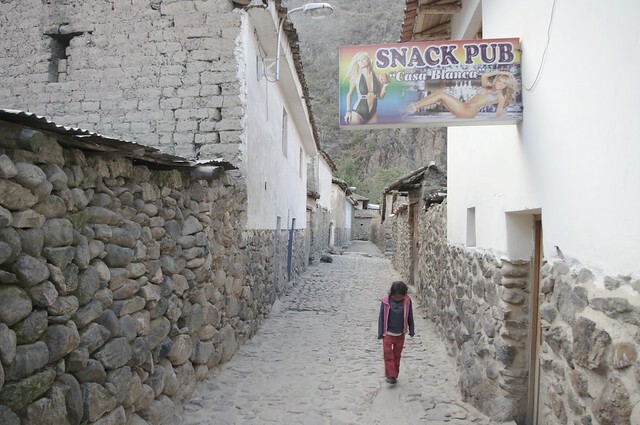 I walked through famous streets and nothing grabbed my attention enough to even take a practice shot. 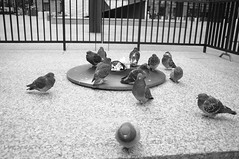 I approached the empty Daley Plaza and could see pigeons congregating near the inextinguishable flame. 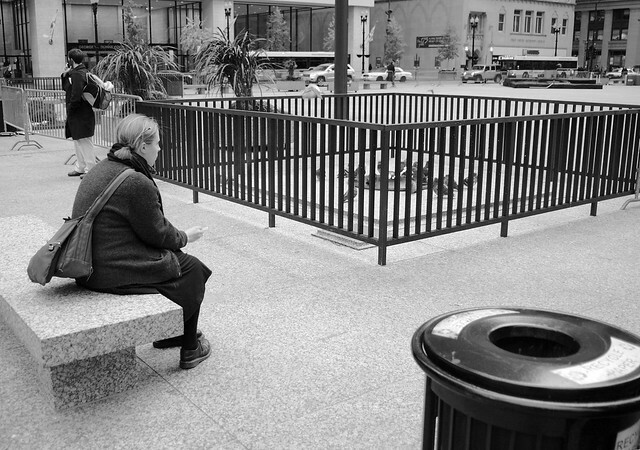 A girl smoked on the bench nearby. Frigid air enveloped the heat seeking pigeons along with the lonely girl, sucking on her own burning cigarette. I started sensing the scene and tried to express it in the picture. It was difficult to get the right frame of the girl and the pigeons. I took some shots but nothing that I was pleased with. Eventually, the girl noticed me and asked what picture I would like to take. “I am interested in these unusual pigeons.” I lied, and took the required shot. We made small talk about the place. She told me it was her favorite, and in good weather it is full of children. 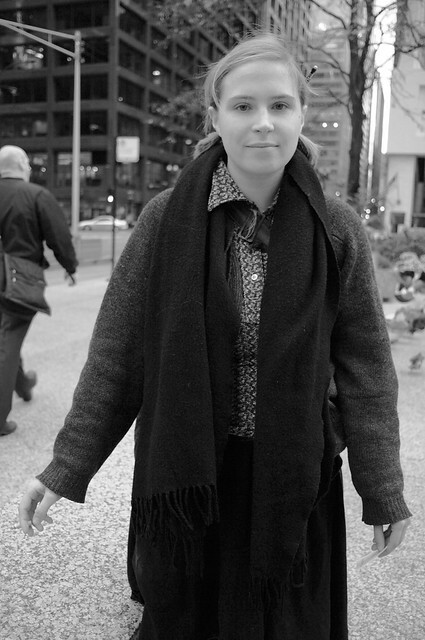 I gave her the address of my blog and asked permission to take her picture. It is not necessary for a picture to be candid in order to be interesting. Some experts support the notion that for candid photography to be “authentic” you cannot use postprocessing for enhancement. Some may say that while it’s ok to use mercury during image development and spiral into insanity, the computer is the “poison” for your creativity. This idea probably stems from the fear that the computer makes things so easy, professionals are going to be overwhelmed by amateurs. It is similar to the perpetual struggle of professional gilds against mass production. Ultimately, progress is inevitable. Opponents of postprocessing are fundamentally misguided because the more good pictures we have, the better. Even with the edition of postprocessing, nothing can make a dull image interesting. The art of photography will always remain in the skill of the photographer. Usually this takes no more than 10 minutes. If I feel that my postprocessing is taking me too long, it’s probably a bad image in the first place. It’s better to take the time to find a better shot, than slave away behind a poor composition. I chose this image as an example because I did nothing with it. After work one day, I had about 3 hours to myself. I decided to kill the time shooting with a 70 mm f/2.4 using a wide open aperture. Considering its reach, this is an amazingly small lens. With 70mm I can always use the viewfinder and there is no reason to think about shooting from the hip. The depth of field (DOF) of f/2.4 is shallow and my only goal is to focus on the object. This is a liberating experience. The challenge is to focus on the moving target, so don’t think about what else you want to be sharp.